I AM THE ONLY CABIN OWNER ON VRBO TO HAVE THESE DISCOUNTS.4 YEARS IN A ROW. THE RATES ARE ALL ON THE PHOTOS FOR YOU TO SEE. I LOOKED HIGH AND LOW TO FINE THESE DISCOUNT FOR MY GUEST. .
Amazin Grace is a cozy and confortable log cabin featuring lots of country charm and all the amenities you want, which makes it a great place to relax. 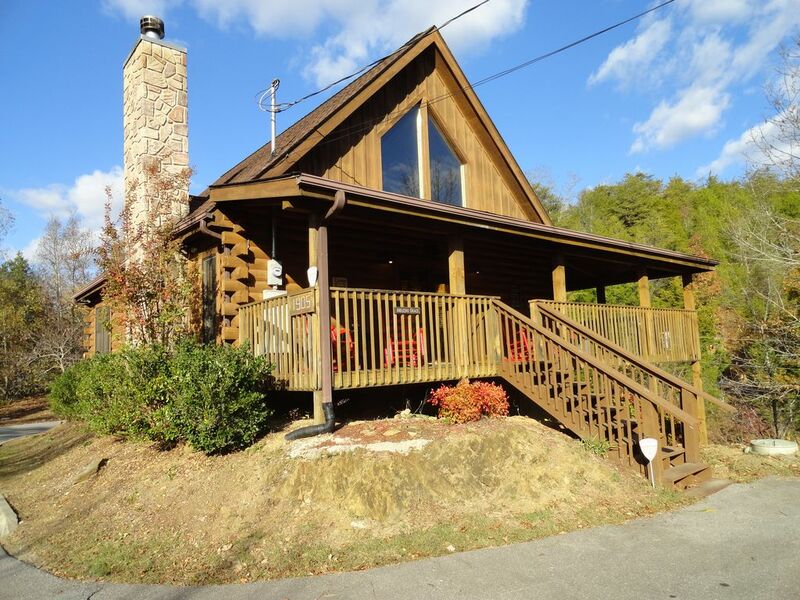 This cabin offers a wood fireplace and a private hot tub, great for a romantic getaway. It has a fully equiped kitchen and a gas grill on the wrap-around porch, where you'll also find four red rocking chairs where you can enjoy your morning coffee while communing with nature. It has 2 bedrooms with a queen bed in each, plus a joining bath rooms in each Also there is a queen bed in the loft an a queen sofa bed in the living room. In the loft you'll enjoy the pool table air hockey, flat screen TV, board games, puzzles, activity books, etc. We are located in the peaceful and secluded Eagle Spring resort, which has a seasonal pool and paved roads. We are a short (10 minutes) ride from the Convention Center. The resort is convenient to all this area has to offer: water parks, Nascar rides, mini and regular golf, horseback riding, hay rides, zip lines, craft and antique shops, outlet malls, not to mention Dollywood, Dixie Stampede, and Dollys newest attraction Lumberjack Adventure. I have great discounts to ALL OF DOLLYS ATTRACTION. These discounts Will save you a Great Deal and you can do more for less with your family. There are restaurants to suit every taste within minutes of the cabin. Don't forget beautiful Cades Cove in the Smoky Mountain (45 minutes from the cabin) where you're sure to see deer, wild turkey, and if you're lucky, a bear or two. Also in the national park you'll find many beautiful spots, great for a picnic. There is a washer and dryer but no detergent because of allergies. Fully Equipped Kitchen with coffee maker, crockpot ,mixer,blender microwave , etc. The cabin was nice and we enjoyed our stay. Amazing Grace is the most beautiful cabin. Spacious, decorated beautifully, great outdoor space on porch - we used the grill once. Upstairs loft has pool table and air hockey. Kitchen was equipped with everything that you would need for meals in and the area is just beautiful. Lot to do in the area if you enjoy great meals and antique/thrift shopping. I cannot wait to return to Amazing Grace for another relaxing get-away. Cabin was just what we hoped it would be! Loved the true cabin feel. Plenty of room for four adults! Comfortable and inviting! The cabin was beautiful! The decorations tied in with the name Amazing Grace!! We loved our stay at the Amazing Grace Cabin! Art was very helpful and quick to respond when we needed him. We would definitely stay here again if we were ever in the area. This cabin was great for our family getaway! It was clean, the kitchen had all the gadgets we needed for cooking & we all enjoyed the hot tub! The big screen tv was also a plus for watching college football on Saturday!